These materials have been prepared by the McVicker’s Family Law, Professional Law Corporation (the “FIRM”) for informational purposes only and are not legal advice. The material posted on this Web site is not intended to create, and receipt of it does not constitute, a lawyer-client relationship. Readers should not act upon it without seeking professional counsel. Hence, the use of this website or communication via it, does not create an attorney-client relationship. No confidential information should be conveyed via email or this website. This website is not intended to be relied upon for legal advice or opinion. Rather, the information is very general in nature. If questions arise, readers are to consult licensed attorneys practicing in their jurisdiction. The attorneys of the Law Office of T. Elizabeth Fields, Professional Law Corporation practice exclusively in Southern California. 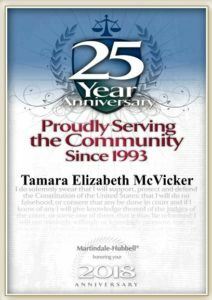 The content of this website is Copyrighted © McVicker’s Family Law, Professional Law Corporation. All rights reserved. Please fill out the form below and a member of our staff will contact you. McVicker's Family Law Mediation Center, Professional Law Corporation, is located in Lake Elsinore, CA, and serves clients in Riverside, Los Angeles, Orange, San Bernadino and Sand Diego Counties.